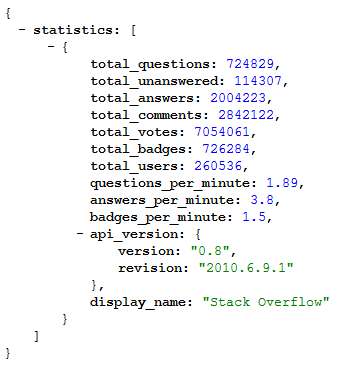 The Stack Exchange API is based on HTTP and URLs, just like the web page you're browsing now. Except instead of HTML, the responses are all in JSON. A single IP address can only make a limited number of requests per day to the API. This limit is determined at by the presence of an API key. Should an IP address be using more than one key, the highest request limit will be used. The No Key limit is meant to facilitate experimentation, not for deployed apps. Requests with invalid or revoked keys are not stepped down to the No Key limit; they just aren't completed. For further discussion of keys, refer to How API Keys Work. How do I announce my application, library, wrapper, or userscript? Create a question here and tag it app, library, or script. Please refer to How to list your application/library/wrapper/script here for suggested formatting. Protip: when working with any API that returns JSON, install the JSONView Firefox Extension. By default, Firefox wants to download the application/json content type. This is not very helpful. JSONView changes the behavior so that you view the JSON in the browser, and additionally get syntax hi-lighting and expand/collapse. A very low friction introduction to the API can be had with SOAPI-EXPLORE. It is always in sync with the current API and provides a documented interface for querying each route. Another very useful tool when working with APIs is the Chrome app "Postman - REST Client". You can even make POST requests, save the requests you make and organize them into collections. Check it out here! Below is python code to get minimal info results. See bottom on how to run. You can paste the code into a jupyter notebook cell and run, or put the code into a file stack-api.py and run from terminal or command line with python stack-api.py. Chrome users, check out the Chrome extension JSONView for Chrome. It's an unofficial port of JSONView for Firefox. Always check for error codes and responses! Always check for the backoff value! If present you do not need to error-out though. Your code can wait the indicated interval and try again. Monitor quota_remaining. When it gets to 0, you are done for the day. API key not shown. Just add &key=YOUR_API_KEY to the fetch URL. Use a filter every time. For lots of results, monitor has_more and keep fetching the next page as necessary. Not the answer you're looking for? Browse other questions tagged support faq getting-started . How will the popularity of hosted apps be determined? How to limit the number of responses in Stack.PHP?